Jeju Island to host Korea 1st PGA Tour event in Oct.
JEJU, South Korea -- The southern resort island of Jeju will host South Korea's first PGA Tour event this fall, officials said Wednesday. 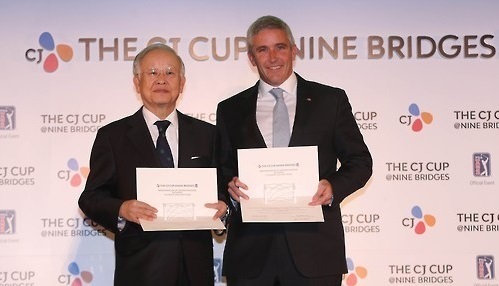 The Jeju provincial government said it will sign an agreement with the PGA Tour and CJ Group, the title sponsor of the tournament named the CJ Cup@Nine Bridges, at a ceremony on Thursday. Jeju Gov. Won Hee-ryong will be joined by Sohn Kyung-shik, chairman of CJ Group, and Travis Steiner, the tour's executive director of championship management, for the occasion. The Club at Nine Bridges on Jeju Island, owned and operated by CJ, will be the venue for the Oct. 19-22 competition. Under the deal, Jeju will provide administrative and financial support to ensure the successful staging of the US$9.25 million tournament. Jeju is also hoping that the tour stop will be a boon for its tourism. This event will be part of the 2017-2018 PGA Tour season. South Korea has previously held events sanctioned by the PGA Tour, including the 2015 Presidents Cup, but never a regular tour event. The field will feature 78 players, with the top 60 players coming from the FedEx Cup standings and the other spots filled by Korea PGA Tour players and others. CJ and the PGA Tour will try to get at least 10 homegrown players into the field. CJ has agreed to a 10-year deal and will remain the host through 2026. The champion will receive 500 FedEx Cup points and a two-year exemption on the tour. There will be 47 events in the ongoing 2016-2017 season, and not counting the national championships of Britain and Canada, there are only four non-US hosts -- Malaysia, China, Mexico and Puerto Rico.